Can I just swoon about these two books? Will that suffice for a review? Can we call it good? Because I liked them that much, yes. As you may recall, a few weeks ago I mentioned that having finished Heavens to Betsy and Betsy in Spite of Herself and didn't find Betsy to be particularly endearing. I found her to be teen aged in all of her boy crazy "glory" and I was put off. With some fear and trepidation, I launched into Betsy Was a Junior and lo and behold - Betsy is growing up! Sure, she's still busy with boys but she's a Junior now and is trying to better herself. I can respect that. (I still respect Tacy MORE because she doesn't feel the need to do everything "The Crowd" does - even when it comes to wearing her hair in a less than fashionable way. Tacy is a brick and I very much like her!) But Betsy's life is changing and she is learning new life lessons. She wins a boyfriend she discovers wasn't worth the trouble and decides to buckle down and be more serious about friends and school and life in general. Furthermore, it looks like Joe Willard might be making her life a little more interesting during her upcoming senior year of high school. 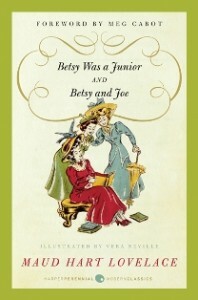 In Betsy and Joe , Betsy's life takes a few more surprising twists and turns as she has to juggle two beaus - one of whom she loves dearly as a brother and the other, Joe Willard, she likes "in another way." Betsy seems to have mastered the art of holding her tongue a bit more and not shouting her feelings about boys from the rooftops. A fact I appreciated, I can assure you! She seems more toned down and she makes some relational mistakes with the friendly beau that cost her some pride (another good thing.) In short, she's learning what it means to be discrete and she is maturing at a rapid pace. I not only found Betsy remarkably tolerable in Betsy and Joe , but I found myself rooting for their relationship and scrambling to get to the end to verify what I already knew to be fact -they would be together. All is right with the world and I sigh in blissful happiness. Now that Betsy is actually old enough to get married (according to 1910 standards) and is officially out of high school, I'm much more interested in her relationship with Joe. It feels more appropriate and less silly and flippant. (Not that Joe ever went for flippancy - being a rock solid gentleman from the get-go!) Their relationship, in my opinion, is realistic. They aren't over-the-moon and yet they are. They have moral standards and they follow them. They are friends first and have bumps in the relationship road. It's all so very tolerable. So I'm writing up this review as fast as I can and moving on to Betsy and the Great World/Betsy's Wedding because it's just........SO FUN! Once again, thanks to Sarah at Library Hospital for hosting the Maud Hart Lovelace Challenge and to Harper Perennial Classics for providing the books to read! I'm reading Heaven To Betsy right now! Can't wait to continue! Oh, and getting married at 18 isn't just a 1910 thing. My mom caught the eye of the new guy her senior year and 6 months after graduation they tied the knot. In 1972. I can't even imagine it!! I'm so glad that you stuck with Betsy - and yes, she does definitely mature in these books. And the clothes! I dream of the jade bracelets and waists and hats that Betsy wears. Can't wait to hear your review of Great World and Wedding! The evidence of maturing occurring over the course of the series is perhaps one of the best recommendations I've heard for any series. Maturing happens so rarely in serial fiction. Well, she still likes boys but she isn't HALF as crazy about them as she was before. Definitely, definitely toned down. Honestly, Carrie? The clothes? I can't see you in them! You are a casual Oregon girl!!! You could wear 40ish clothes right now if you wanted. But a bustle and full skirt??? I really enjoyed seeing Betsy mature as well. I just finished Betsy was a Junior and am excited to see how the senior year plays out. And I would love to know more about Tacy's interior life. I second what Kate C. said. I would have loved it if Maud wrote a book from Tacy's perspective. It always seemed like that would be an interesting world to further explore. I basically just wish Maud had just written more books period, because I can never get enough of them!